The new orders metric fell a whopping 13.2 points to 51.2. Manufacturing growth screeched to a near-stop for January, according to an Institute for Supply Management report released today. After December's index reading clocked in at a solid revised 56.5%, January's index tumbled down to 51.3%. Cold weather delayed shipments of raw materials and caused some factories to shut down. Based on surveys of purchasing managers, a reading above 50% indicates that the manufacturing economy is generally expanding, while below 50% indicates that it is generally contracting. Market analysts had expected a slump, but their 56.0 estimate proved too optimistic. 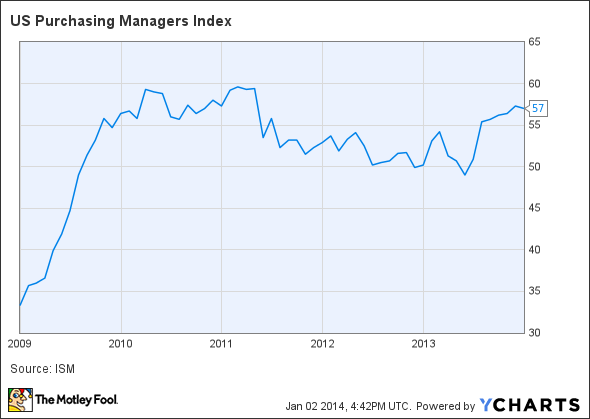 U.S. Purchasing Managers Index data by YCharts. On a component-by-component basis, the all-important new orders metric fell a whopping 13.2 points to 51.2, one of the largest month-to-month drops ever recorded for this indicator. Production dipped 6.9 points to 54.8, while the longer-term-employment component shaved off 3.5 points to clock in at 52.3. While all these components remain in growth territory, January's losses put a quick finish on December's sustainable gains. Eleven of the 18 reporting manufacturing industries noted growth, with plastics and rubber products leading the improvement. Of the seven reporting contractions, nonmetallic mineral products took the deepest dip, followed by petroleum and coal products. Research firm Markit also reported on January manufacturing today, with similar slumps recorded.